This article is the first in a series of articles that will discuss various characteristics of the 40 most successful hotel investments in recent U.S. history. Hotel Appraisers & Advisors, LLC (HA&A) evaluated thousands of hotel transactions that occurred during the past 20 years. We narrowed our evaluation to hotels that have been bought and subsequently sold for a higher price. Then we ranked these hotel investments according to each transaction’s increase in price, expressed as an annualized percentage increase. These top 40 hotel investments represent annualized returns of approximately 32 percent to 166 percent, based on the difference between the acquisition price and the exit sale price of each hotel. This simple comparison does not account for capital expenditures made by each investor to renovate or improve each hotel. 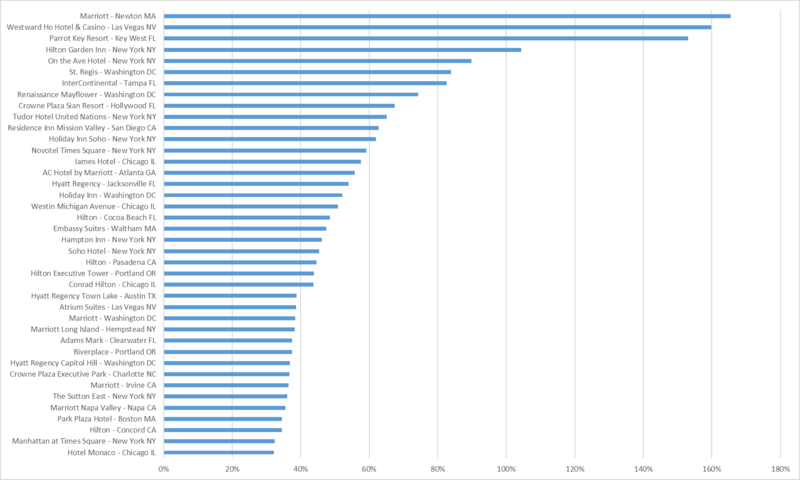 The following figure shows a summary of these 40 hotels, ranked by their annualized percentage returns. When is the best time to acquire a hotel. Of course, if an investor could buy at the trough of an economic cycle and sell at the peak of an economic cycle, that would be ideal. But nobody knows exactly when cycles will begin and end. So, HA&A evaluated when did the acquisitions actually occur for the 40 hotel investments that produced the greatest annualized returns? At what point during the past two economic cycles did investors acquire these hotels? The following figure shows when these 40 transactions occurred relative to the two previous recessions. 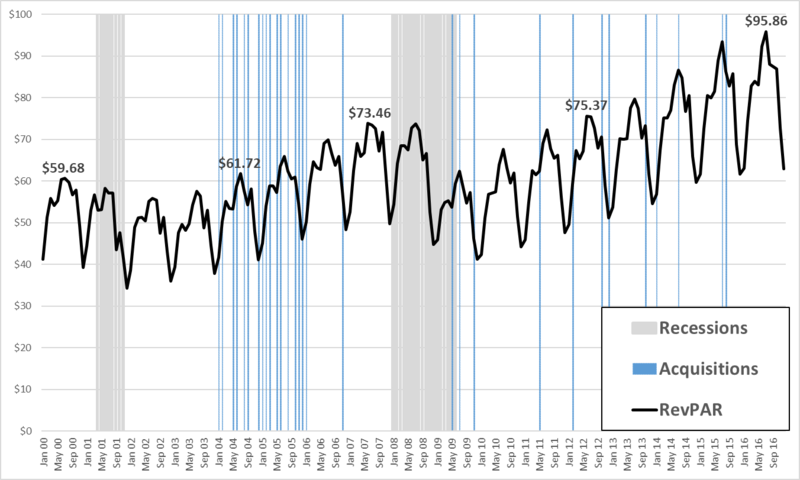 To gauge the progress of each economic cycle, the black line in the figure shows the national average monthly revenue per available room (RevPAR) at all U.S. hotels. What we can see in this graph is that the majority of these profitable acquisitions took place in the middle of the business cycle. Specifically, they tend to start occurring in the recovery year in which hotel RevPAR levels exceed their pre-recession peaks. So, after RevPAR peaked in 2000, the recession of 2001-2002 led to significant RevPAR declines. National RevPAR levels resumed growth in 2003. But RevPAR did not recover to its pre-recession peak until the middle of 2004. All 26 of the highlighted transactions of the first economic cycle occurred in 2004 or later. Similarly, in the second economic cycle we studied, RevPAR levels peaked in 2007, then declined sharply in the last quarter of 2008 and throughout 2009. National RevPAR levels resumed growth in 2010 and 2011. But RevPAR did not get back to its pre-recession peak until mid-2012. Although 3 of the transactions we reviewed occurred in 2009, 10 of the 14 transactions in the second economic cycle did not occur until 2012 or later, once RevPAR levels had recovered to pre-recession peak levels. The second thing we noticed about the timing of all 40 acquisitions is that they all occurred at least a full year prior to the onset of the next economic recession. The latest top-40 acquisition in the first economic cycle occurred in November 2006, about 14 months prior to the onset of the next economic recession. The latest top-40 acquisition we identified in the second economic cycle occurred in September 2015, approximately 24 months ago. Presumably we have not yet entered a new economic recession, as of September 2017. So, all 14 of the acquisitions we identified in the second economic cycle occurred at least two years prior to the onset of a recession. The old adage of “buy low and sell high” still holds true. But given the difficulty of timing markets, our research identified a couple of other metrics that may be helpful to investors. Firstly, the majority acquisitions we analyzed did not occur until strong economic recoveries were well underway. More specifically, 90 percent of the top 40 acquisitions we studied occurred during or after the year in which national hotel RevPAR levels recovered to their pre-recession peaks. Secondly, all 40 of the acquisitions we identified occurred more than a full year prior to the onset of a recession. It takes time to implement re-positioning strategies after an acquisition. It takes additional time to market and sell a hotel after it has been re-positioned. Investors don’t want to get stuck trying to implement their exit strategies once an economic recession begins. In conclusion, it appears that the most profitable hotel flips of the past two decades resulted from acquisitions that took place in the middle portions of their respective growth cycles. Looking to the future, there may be some upside potential for opportunistic buyers to invest earlier in the recovery cycle after the next recession. Two factors that have prevented buyers from doing this during the past two cycles were the lack of willing sellers and limited access to debt capital. To attract more sellers, buyers could have offered higher bid prices during the past economic recessions. To address constrained debt capital, buyers could build up war chests heading into the next recession and be prepared to buy with all-cash or lower leverage initially. This article is the first part of a series that will evaluate various characteristics of several top hotel investments in the United States during the past two decades. HA&A specifically searched hotel investments with transaction dates between 2000 and 2017. The issue of capital expenditures, and corresponding adjustments to each investor’s return, may be explored in a subsequent article.